Note: This species is very similar to O. musci-muralis var. 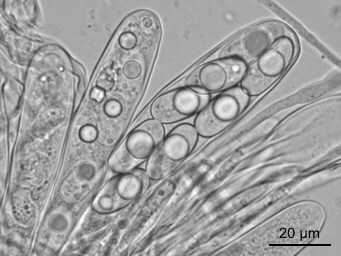 neglecta but has slighly larger ascospores and parasites on Grimmia rather than Schistidium. Dougoud, R. & Roth, J. 2003. Le champignon du mois (5). 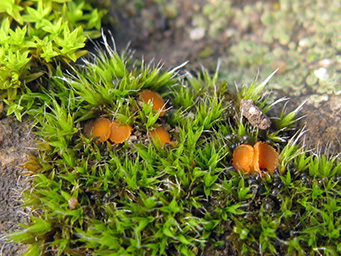 Octospora musci-muralis Graddon. - SZP/BSM 81/2003: 97-99. Lindemann, U. & Wieschollek, D. 2009. Operculate Untermieter - Zwei interessante Becherlinge im Botanischen Garten der Ruhr Universität Bochum. - Der Tintling 1/2009: 19-24. Peric, B. 2011. 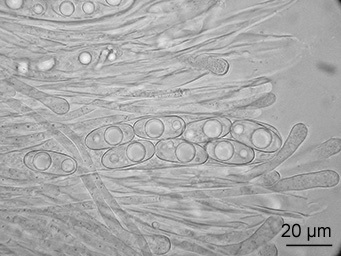 Octospora musci-muralis var. 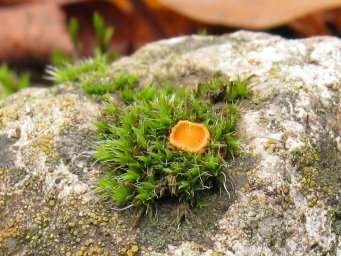 musci-muralis, une espece nouvelle pour la flore mycologique du Montenegro. -Errotari 8: 18-29.